As we head into hay fever season, it can be difficult to pinpoint the cause of your congestion– are your sniffles due to seasonal allergies or a sinus infection? The two conditions share similar symptoms, but are not the same thing. Allergies occur when our body’s immune system mistakes a harmless, everyday substance for a dangerous one. The body releases histamines to fight the perceived intruder (the allergen), causing symptoms such as coughing, sneezing, itchy eyes, runny nose and scratchy throat. Pollen and mold are major allergens for millions of people, and during springtime, as plant species begin releasing pollen particles into the air and outdoor molds release their spores, cold-like, allergy symptoms abound. These seasonal allergies are sometimes called “hay fever” or seasonal allergic rhinitis. In contrast, a sinus infection occurs when your nasal cavities become infected, swollen and inflamed, usually due to a virus. Infected sinuses cause pain and pressure in the face, severe congestion, and nasal discharge that is cloudy, green, or yellow. Other possible symptoms include sore throat (due to post-nasal drip), fever, tooth pain, headache, and bad breath. 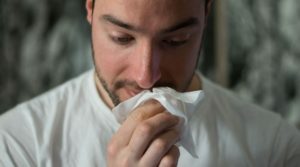 While allergies and sinus infections are separate conditions, their treatments do share some overlap—if you are experiencing congestion with either, a decongestant medication can help to break up mucus in your nasal cavities. Allergies can be treated with antihistamines, such as Benadryl, Zyrtec, and Claritin. These medications block the body’s histamine-producing response and help to reduce symptoms. Allergies cannot be fully prevented, but you can minimize your exposure to known allergens. For viral sinus infections, your best bet is to rest and drink plenty of fluids. Antibiotics are not effective in treating viruses. Nasal irrigation can also help to clear your sinuses, relieve dryness, and flush allergens. With proper care, most sinus infections go away on their own within 1-2 weeks. If you’re suffering from seasonal allergies or a possible sinus infection, head into our clinic today. Our friendly medical team can offer quick treatment and expert advice to help you feel better.